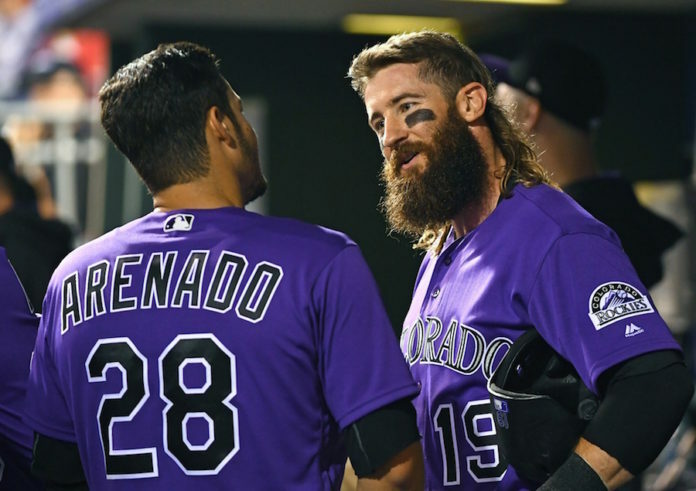 On Monday, the three finalists for the National League Most Valuable Player Award were announced, and despite the Rockies’ playoff appearance, despite Charlie Blackmon’s batting title, despite Nolan Arenado’s top-three rankings in doubles, home runs, RBI and wins above replacement (WAR), neither of Colorado’s dynamic duo made the cut. Feel free to pick your jaw up from the floor when you’re ready. We’ll wait. Arizona’s Paul Goldschmidt, Cincinnati’s Joey Votto and Miami’s Giancarlo Stanton were named the NL’s three finalists in what amounted to an extraordinary and indefensible dismissal of the Rockies’ organization, Coors Field, and most importantly, two of the league’s most complete players in Arenado and Blackmon. Goldschmidt’s inclusion is a no-brainer; he may very well have deserved the award over Arenado and Blackmon regardless. As the best player on a 93-win team, Goldschmidt’s .297 batting average and .404 on-base percentage was complemented by 73 extra-base hits — 36 of those home runs — and 120 runs batted in. Great numbers, coupled with a playoff appearance usually makes for a strong MVP case. Giancarlo Stanton hit 59 home runs for the 77-85 Marlins, driving in 132 to lead the league in both categories. He hit. 281 but was also seventh in the league in strikeouts with 163 (NOTE: Rockies shortstop Trevor Story led the NL with a whopping 191 strikeouts). Stanton’s power made him much-watch television, and his impressive 1.007 on-base percentage plus slugging percentage (OPS) was second only to the league’s third finalist. That would be Reds first baseman Joey Votto, who put together a phenomenal bounce-back season, leading the league with a 1.032 OPS and a 9.6 WAR; advanced metrics that illustrate how impressive his campaign was. Votto hit .320 with 36 homers and 100 RBI, while walking 134 times to lead the league with almost half as many strikeouts as Stanton (83); a feat almost unheard of in today’s home-run-or-strikeout game. Votto’s team lost 94 games, however — they were in last place with him, and they would have been in last place without him, bringing the “valuable” part into question, even if that’s through no fault of Votto’s. In contrast, Blackmon (.331-37-104) and Arenado (.309-37-130) certainly cannibalized each other’s votes; on the field — in Arenado’s case, at least, he would have scooped up at least a few more RBI had Blackmon not gathered them up — and off the field, as voters likely couldn’t decide which of the two were more worthy. 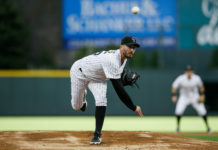 Nevertheless, Rockies fans will feel like the snubs were little but a slap in the face, but they were also a factor of bad luck — teams that happen to have two MVP candidates rarely snare the actual award — and the fact that baseball’s voters now evaluate a player’s performance somewhat independently from his team’s. Knowing that, however, provides little consolation to the Rockies, their fans, and to two elite players who deserved far better.